Jade Jones says she is older and wiser but just as determined as she goes into the final tournament before defending her Olympic crown in Rio. 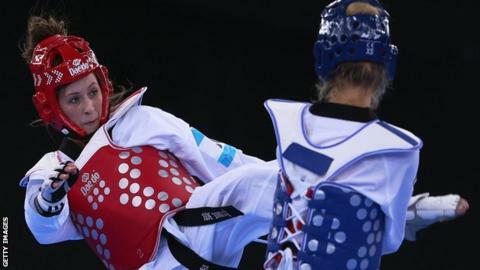 Jones competes in Switzerland on Thursday determined to add the European Taekwondo gold to her Olympic title. "Four years ago in the last Europeans before the Olympics I was young and I wanted to show off," Jones said. "But I'm older now and I just really want to get this European title." Jones was a surprise entry in London 2012 - just two years after joining the British Taekwondo academy. She was only 19 when she beat China's Yuzhuo Hou to win the women's -57kg title. Having secured a place in the -57kg category in the Rio Games, Jones missed March's Dutch Open and April's President's Cup with a knee injury. She won the German Open on her return and is aiming to repeat the feat in Montreux. "I had a little niggle, so it was a bit frustrating but I think it was just best to take a bit of rest and get a bit of rehab and strength behind it," she said. "But it's good now and I've been training hard and I did really well in Germany and I'm looking forward to going and winning this time. "I've had close calls and I haven't quite got it - I want to get the European under my belt finally. "It would be amazing to be European champion going into the Olympics." Jones admits her preparation for Rio is in stark contrast to London. "The two are so so different," she added. "For London I only found out six months before that I was going. "This time I've been training for four solid years. It's been a much longer road and I feel ready and more wise."